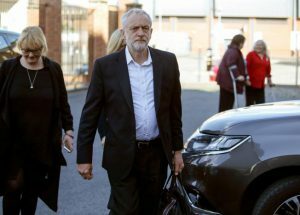 They write: “The leftist Labour leader forcefully condemned the ‘horrific terror and the brutal slaughter of innocent people.’ But unlike his political peers, Corbyn did not depoliticize the bombing. He explained that in order to prevent future attacks, Britain’s foreign policy must change. Foreign wars may not be the only thing fueling this violence, he noted, but they are a key factor. “British intelligence services played a direct role in supporting Islamist militancy in Libya, working closely with the Al Qaeda-affiliated Libyan Islamic Fighting Group (LIFG) in a cynical bid to topple Qaddafi. When NATO escalated 2011 protests in Libya into an explicit regime change operation, the U.S. and U.K. governments encouraged foreign fighters to travel to the North African nation to help fight. Among those who took the MI6 ratline from Manchester to Libya was Ramadan Abedi, the father of the bomber. “In a groundbreaking speech on May 26, Jeremy Corbyn pledged to ‘change what we do abroad.’ He linked Western wars of aggression to the plague of violent jihadist attacks targeting soft targets in the West.